Autotrophs and heterotrophs are the organisms which are characterised based on their nature of food creation and consumption. there is also an another type of organisms which are called as saprophytes. Autotrophs are the organisms which create their own food with the help of process called photosynthesis by utilizing water, carbon dioxide in the presence of sunlight and chlorophyll. Heterotrophs are the organisms which obtain their food from other plants and animals. They cannot create their own food and depends on the other living organisms to obtain food. Saprophytes are the organisms which are neither autotrophs nor heterotrophs because they obtain their food from the dead cells or Dead organisms by breaking down the cells of the organisms. 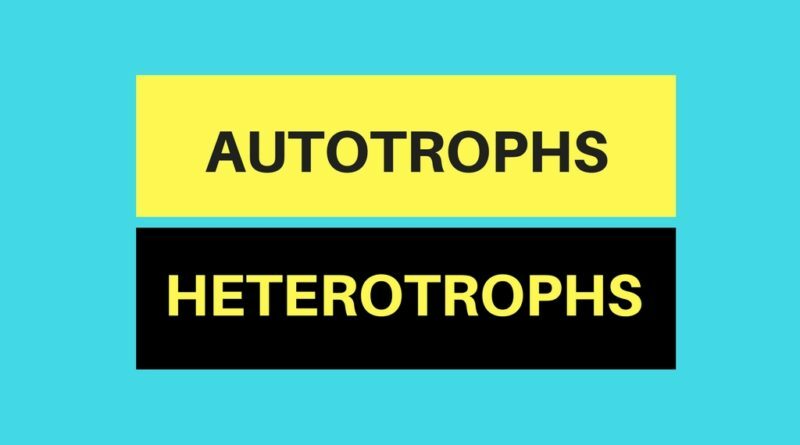 There are many differences between Autotrophs and heterotrophs Based on their method of food obtaining and food consumption, nutrition, process they used to obtain and create the food, absorption of food, etc. Autotrophs are the organisms which create their own food. Heterotrophs are the organisms which are dependent on other organisms for their food. Autotrophs use inorganic materials like carbon dioxide, water, Sunlight to create their own food. Heterotrophs procure food by feeding on other organisms directly or indirectly. Autotrophs use colouring pigments like chlorophyll in the process of photosynthesis to produce food. Heterotrophs don’t need any coloring pigments to obtain food. Autotrophs are mainly green plants. Heterotrophs are also called as parasites and some examples are animals, birds, fungi, some Protozoa, etc. Autotrophic nutrition is influenced by biochemical catalytic substances, water, humidity, temperature, etc. Heterotrophic nutrition is influenced by digestive enzymes, Nature of food what is vegetarian or non-vegetarian, etc. Plants and animals have their own importance in the atmosphere. The plants release oxygen into atmosphere which is utilized by animals and the animals help the plants in the process of pollination of seeds, nutrition like natural fertilizers, dung, etc. ← What is GST (GOODS AND SERVICES TAX). ?